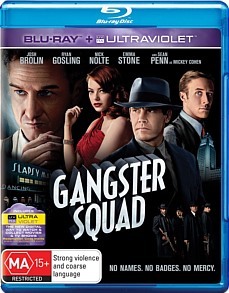 Gangster Squad Blu-ray Review It is actually quite fun to be drawn into this world of yesteryear where everything seems so glamorous, even the gangsters seem so slick. Set in Los Angeles in 1949, Gangster Squad is the true story of the demise of the head of Los Angeles’ organised crime, Mickey Cohen (Sean Penn). Cohen is a dangerous man and has bought out several police and court members. The LAPD decides they are going to go after Cohen and bring him and all his criminal operations down. Sgt. John O’Mara (Josh Brolin) is head of operations and takes into this quest a number of chosen policemen with particular talents useful to the overall plan. O’Mara’s close friend, Jerry Wooters(Ryan Gosling) refuses to be part of operations at first, but when he falls for Cohen’s etiquette coach/girlfriend and see’s what he is capable of, Grace(Emma Stone), he joins up. It is no easy job bringing down Cohen and his gang and what ensues is war. Gangster Squad is not a bad film, that is for sure. It is not a spectacular blockbuster that will blow you away, but is still not a bad film. It feels as if the film really doesn’t kick into gear until about the 80th minute. All of a sudden you start to really appreciate the characters, feel a bit more emotion and there are finally some spectacular gun fights with the accompaniment of amazing cinematography. It is a shame that the whole movie wasn’t more like the last 30 minutes. It’s as though the movie becomes what it should have been all along. In order to be a great film, it needs to be all it can be for the entirety of the film. The time period of 1949 is very well recreated. You can understand why everyone wanted to be part of the Los Angeles/ Hollywood scene at this point in time because it was just so classically glamorous and this is portrayed perfectly on screen. The costume design for each of the characters is very good. What director Ruben Fleischer has done with Gangster Squad is very reminiscent of the early Hollywood gangster films and this works for the film. It is actually quite fun to be drawn into this world of yesteryear where everything seems so glamorous, even the gangsters seem so slick. Sean Penn’s performance as Mickey Cohen is wonderful. He gives all he can and is very convincing as the mob boss. He has a likability at times, but you still remember that this is a very dangerous man and Penn portrays this well. Josh Brolin is also very good as John O’Mara, but again, his performance becomes brilliant only towards the end of the film. Ryan Gosling and Emma Stone both do well, but once again, they are at their best towards the end of the film. The Set Up covers everything in pre-production and production that you will ever need to know. There are interviews with all the cast and crew, as well as interviews with family members of the original Gangster Squad who went in pursuit of Mickey Cohen. There is also the amazing construction of such sets as that for the nightclub, Slapsy Maxie’s. The documentary, “Rogue’s Gallery: Mickey Cohen”, is an interesting watch as it not only goes through Cohen’s life in detail, but it presents him in a different light as to how you see him in the movie. It presents him as a good guy which everyone likes and almost makes you believe that he couldn’t harm a fly. Yet, after seeing the film and putting that together with the fact that he was a mob boss, we know that he could harm a lot more than a fly.